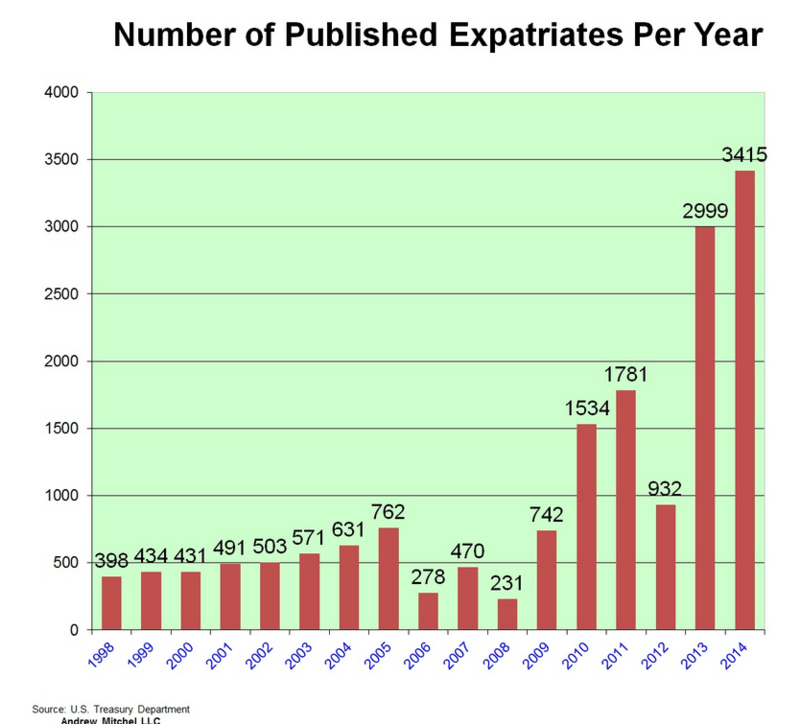 ” While politicians are focused on all the foreigners who want to become Americans, perhaps they should consider all the Americans who are becoming foreigners. 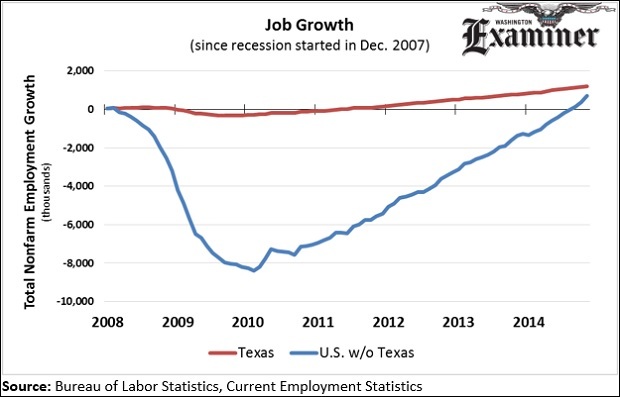 ” Since the recession began in December 2007, 1.2 million net jobs have been created in Texas. 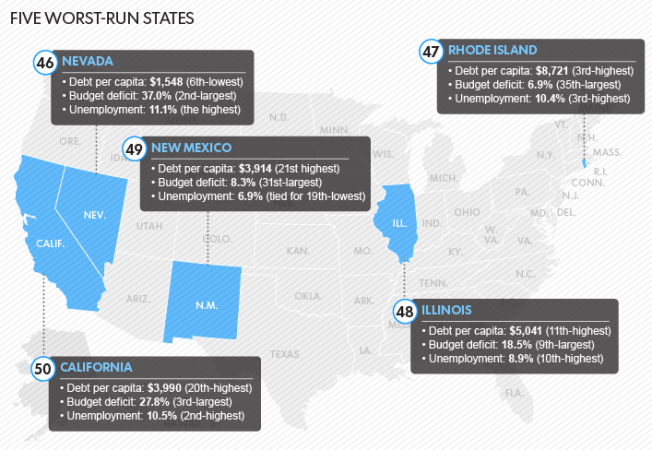 Only 700,000 net jobs have been created in the other 49 states combined. 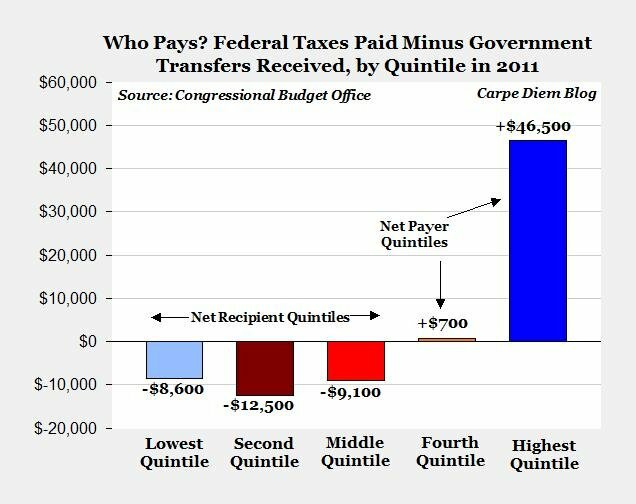 ” The Congressional Budget Office (CBO) just released its annual report on “The Distribution of Household Income and Federal Taxes” analyzing data through 2011 on American household’s: a) average “market income” (a comprehensive measure that includes labor income, business income, and income from capital gains), b) average household transfer payments (payments and benefits from federal, state and local governments including Social Security, Medicare and unemployment insurance), and c) average federal taxes paid by households (including income, payroll, corporate, and excise taxes). Some of the key findings of the CBO analysis are displayed in the table above, with the data organized by household income quintiles. The data in the first five rows above appear in the CBO report (from Tables 1 and 4), and rows 6-8 above have been calculated separately based on data from the first four rows in the table. ” The federal government has shelled out more than $700 million in paid leave to more than 57,000 employees who were home from work for time periods stretching from one month to three years, a Government Accountability Office report has found. ” In many cases, employees were home awaiting the outcome of investigations into alleged misconduct and criminal actions. Some racked up paid leave for “physical fitness activities,” and others were away from work seeking professional development. Employees also took paid leave for “recuperation” from overseas work. ” While corporate welfare, whether in the form of subsidies or bailouts, is more often associated with the federal government, state governments also regularly use generous, targeted subsidy packages to entice corporations to locate within their borders. As these charts show, corporate welfare is a significant problem at the state level, with New York State leading the rest. This week’s charts use data from the Subsidy Tracker 2.0 dataset compiled by Good Jobs First, a government accountability and smart-growth advocacy group, to display the states (plus the District of Columbia) that disperse the highest amounts and numbers of subsidies, along with the top parent corporations that cumulatively benefit from these subsidies. Comprehensive data on total state assistance to private businesses have long been hard to access, since the relevant information has been inconsistently scattered among various government reports and websites. The Subsidy Tracker project is an ambitious effort to compile state data on subsidized projects, amounts, beneficiaries, and outcomes in one location. The dataset distinguishes between 11 types of subsidies, including tax credits and rebates, property tax abatements, low-cost loans, infrastructure assistance, and enterprise zones. The dataset is a constantly updated work-in-progress; while it does not yet contain every single state subsidy, it is one of the most comprehensive sources of state subsidies assembled so far. Additionally, the database compilers decided to count sales tax exemptions on business purchases of inputs as a “subsidy.” However, some economists argue that applying sales taxes to input purchases would inefficiently favor vertically integrated firms over firms that purchase inputs from other businesses. Therefore, this kind of sales tax exemption is not a “subsidy,” but an efficient tax policy. Despite these important limitations, the dataset can give us an early glimpse of the rough value of the subsidies that each state issues. The User Guide provides further details on the methodology. The first chart displays the states known to have extended cumulative subsidies exceeding $1 billion, according to the dataset. 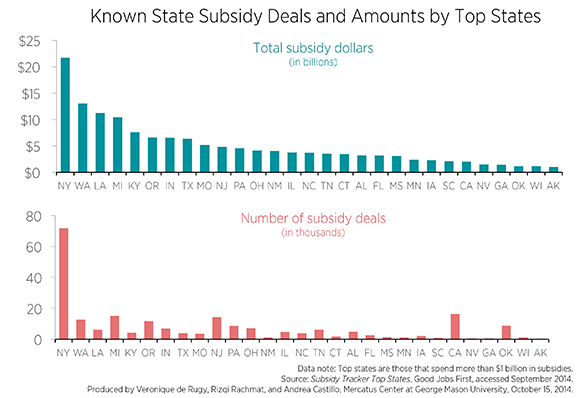 In the top portion, the states are ranked, left to right, from the highest amount of subsidies to the lowest amount of subsidies. In the bottom portion, the equivalent number of deals are displayed for each state. ” If you use Facebook, pay taxes, enjoy fishing or drive a car, the 2014-2015 term of the Supreme Court, which begins Oct. 6, will be worth watching. Many of the cases from the last term touched on issues such as executive power, religious liberty, free speech and racial preferences. 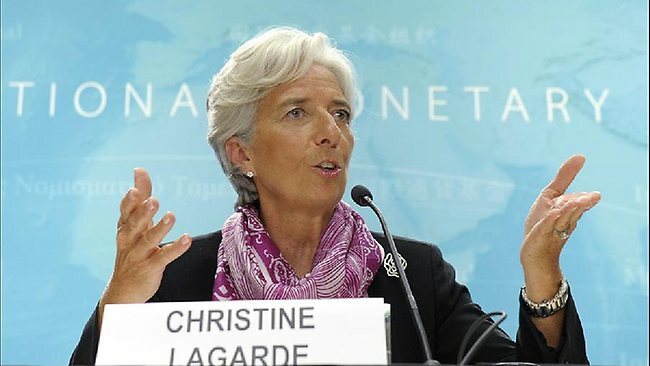 ” I have gone on record that the most dangerous organization is the now French led IMF with Christine Lagarde at the helm, which has presented a concept report that debt cuts for over-indebted states are uncompromising and are to be performed more effectively in the future by defaulting on retirement accounts held in life insurance, mutual funds and other types of pension schemes, or arbitrarily extending debt perpetually so you cannot redeem. Yes you read correctly, The new IMF paper is described in great detail exactly how to now allow the private sector, which has invested in government bonds, to be expropriated to pay for the national debts of the socialist governments. 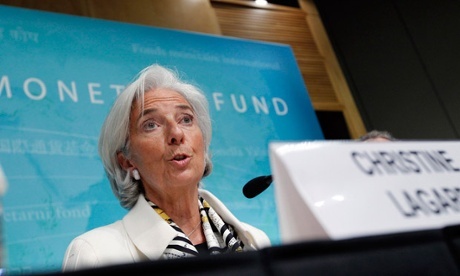 ” The International Monetary Fund slashed its forecast for US economic growth on Monday, citing a harsh winter, problems in the housing market and weak international demand for the country’s products. As part of a series of reforms the IMF has called for an increase in the minimum wages in the US, currently the lowest when compared to the average wage in any of the Organisation for Economic Co-operation and Development (OECD)’s 34 countries. ” The latest Reason-Rupe poll asked Americans if they would support or oppose changing the federal tax system to a flat tax, where everyone pays the same percentage of his or her income, finding that 62 percent favor the flat tax and 33 percent are opposed. When asked where they would set the flat tax, the average response was 15 percent. This reflects another recent Reason-Rupe poll finding that 67 percent of Americans say it is “not the responsibility of the government to reduce the differences in income between people with high incomes and those with low incomes,” while 29 percent say it is. Is US Giving Up ICANN Control Good For Freedom Or A Threat To It ? ” The Obama administration’s decision to relinquish oversight over the group that manages the Internet’s architecture has raised an early red flag with Republicans, who blast the move as a threat to free speech. Exactly who would regulate the Web’s back-end is unclear, but the decision already has sparked backlash among some in the GOP, who warn it could allow the United Nations or authoritarian countries to step in and seize control of the Web. At first glance the Obama administration’s promise to relinquish control over ICANN seems like a good idea … one less thing the government controls … but given that this administration is not known for championing liberty and the free markets one is left wondering if this is a back-handed way for the Statists to cede control over the free flow of information to the UN or some other Statist body while appearing to do the opposite . There is much talk as well that this new move opens the door to an internet tax and censorship which should be of concern to us all . 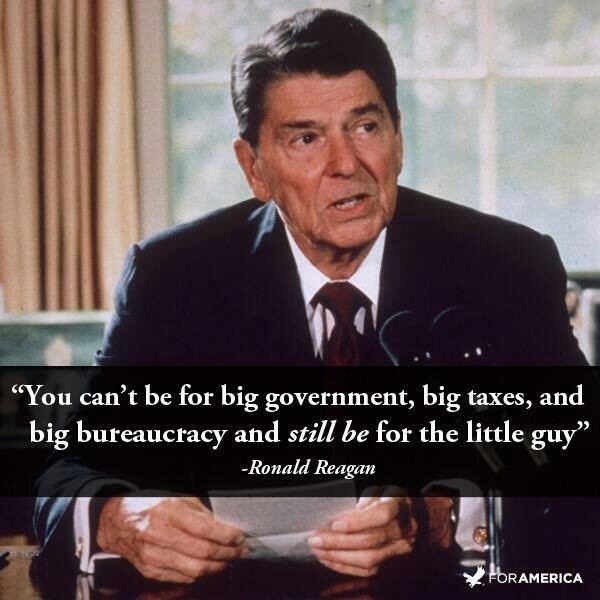 If there is one thing we know about the Obama administration it is that it loves both taxes and regulation so we cannot help but wonder that something larger is at play here than “fairness” and freedom . ” For several years now, 24/7 Wall Street has analyzed how well each state within the United States is run by its elected officials and government bureaucrats. To determine how well each state is run, they looked at each state’s financial data as well the services that each provides to its residents, while also factoring in their standard of living. 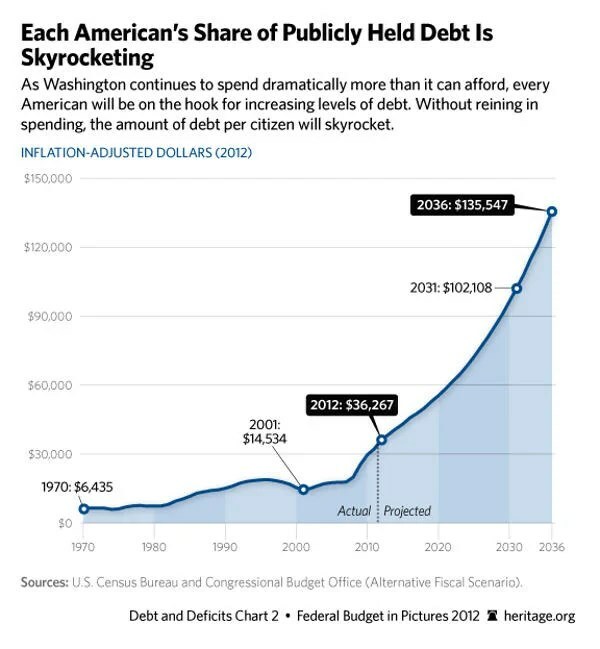 Is it any wonder these states produce more than their share of corrupt politicos in DC ? In the event that our readers had any doubts as to why a proposed $60 million project , as mentioned in our previous post , ends up costing $94 million this picture should serve as a stark reminder of the cost of government business . In 1776 A 3% Tax Ignited A Revolution – What Will It Take For Us To Rebel ?